I saw this book floating around on blogs and Instagram with reviews claiming that just like the name, it really is life changing! 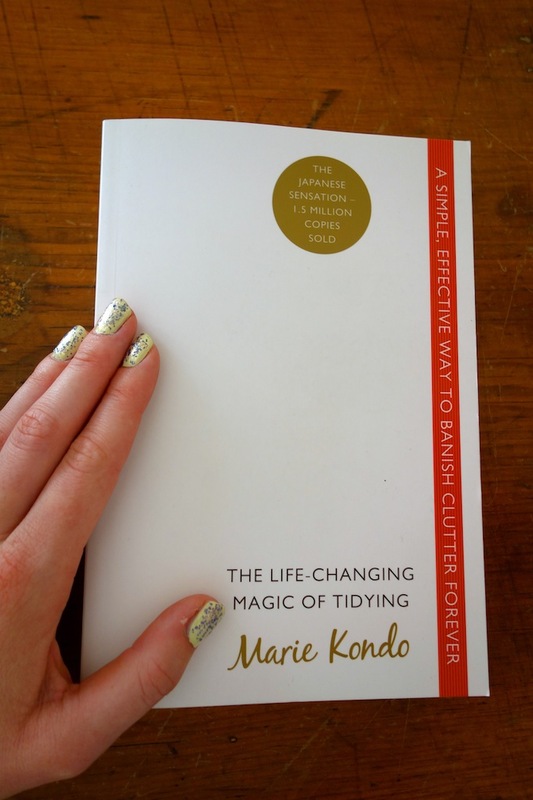 After finishing it and carrying out the steps that Marie Kondo outlines in the book, I can confirm, it really is life changing! I am currently carrying out the task of fitting my life into two suitcases and one piece of hand luggage before I move to Chile. Before reading this book, I seriously thought this was an impossible task. Firstly, because I had too much stuff to fit into two suitcases but also because I thought, I can’t leave any of this stuff behind; I need it to feel happy and I need it to live my life properly. I now feel very differently. The book is actually much more about banishing clutter than about tidying. Before you can even begin to think about any sort of organising or arranging in your home, you must first de-clutter! It is about getting rid of stuff that you really don’t need, stuff that adds nothing to your life and stuff that you find really hard to get rid of. Marie starts off by claiming that you will feel calmer and happier once following the steps in the book, I was doubtful. I worked through the book that in turn talks through clothes, book, komono (miscellaneous items) and lastly, sentimental items. She suggests that instead of sorting by area, you sort by these categories and in this order. Usually, when I have a sort out I will do one drawer, box or area at a time but it’s so true that this doesn’t give you an idea of how much of each object you have. You also must touch each item to see if it sparks joy. I really had never thought about doing this before. The idea of putting every single one of your books on the floor is pretty daunting but touching each item really helps you decide whether to keep it or not. Perhaps the most helpful, was the chapter on clearing out sentimental items. Marie says that just because the item is attached to a memory, it doesn’t mean you delete the memory if you discard the item, so true! Anyway, I have sorted out so so much stuff and I am now ready with my minimalist amount of things… to move to Chile with much less than I previously had. I feel prepared that I have everything I need and I feel calm about it too 🙂 Of course, most people use this book to put their home in order but I found it so helpful for getting ready for my move. Have you read it? If not, I seriously recommend that you read this book!! If you have a bad memory, like I do, that item might be the only way for you to remember. I am looking forward to reading the rest of the book, but with reservations about what I have heard about the method. Ah, I guess not everyone likes the method, but I found it an amazingly inspiring book and am so glad I read it! I seriously can’t believe that so many people have claimed that her method works! I’m eager to try it for myself, but the book has been on hold for me for more than a month now. Some day…. Thanks for the recommendation, I like this idea of touching each object to see if it sparks joy! You’re welcome! I thought that idea really worked, it wasn’t something I’d ever thought of before. Sounds really interesting! I will check it out… Thanks for the recommendation! I really want to read this book, though some times I go through phases where I want to throw out everything!! The thing is…how do I persuade my brother (who is a hoarder) to read it??? Maybe leave highlighted photocopies around the room hehe 😉 Could be tough!